Imagine, if you will, a train running smoothly along the track, carrying out its business just fine and as inoffensively as can be. But then, just up ahead as the train nearly completes its journey, a giant block of wood is laying on the track, and it causes the train to roll off the track and crash devastatingly on the land around it. The train, which up until that point was running along just fine, is completely destroyed and everyone inside sadly brought down with it, all thanks to that nuisance block of wood that screwed everything up. If that isn’t a sound-enough metaphor for our viewing experience of Sunset Song, we have no idea what is. 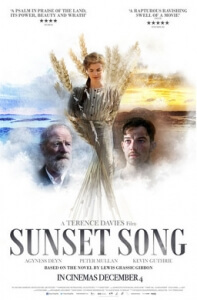 For the first two-thirds of the film, Terence Davies’ adaptation of Lewis Grassic Gibbons’ early 20th century Scottish novel, in which young farmhand Chris Guthrie (Agyness Deyn) experiences life, love and loss during the lead-up to the First World War, is completely serviceable. It’s well-shot, with Davies and cinematographer Michael McDonough capturing some truly beautiful images of the Scottish countryside; it’s well-acted, particularly by the lively Deyn and also by Peter Mullan as her cruel, cantankerous father; and though it’s a little slower-paced than it could possibly be (extended sequences such as just the lead-up to a church sermon could have definitely be trimmed down or removed altogether) it’s nothing too torturous to sit through. For a while, it’s a completely fine movie that’s not great necessarily but good enough to make us feel glad we saw it… but man, when it drops the ball, it drops the friggin’ ball. It’s a shame that we can’t really go that much into detail about this particular section of the movie, because it is technically a spoiler and we still aim to keep things as unspoiled for readers as much as possible, but know that it is a section so misguided and so ill-advised that it flat-out kills the rest of the movie stone dead. What we can discuss, however, are certain things that lead up to it. Over the course of the film, and we’re guessing the book it was based on as well, our heroine Chris meets, falls for and eventually marries a young farmer by the name of Ewan (Kevin Guthrie). While it’s not necessarily a complex relationship by any means, it is still one that’s sweet enough to engage the viewer and convince them that their mutual love is apparently genuine (thanks to the good performance by both actors). Ewan himself seems to be a nice enough guy, eager to actively support his wife in her duties while running her farm, and desiring to put his partner and eventual family before anything else – including, most notably, the outbreak of the First World War. Naturally, based on the growing pressures of the rest of the world that sees him as a coward for not enlisting, he does indeed sign up – and that’s where we’re going to leave it, because almost everything that happens from that point onwards is not only what causes the movie to derail completely and become this unforgiving train-wreck, but also spoiler-heavy which means we can’t go into further detail even if we wanted to. However, that’s not going to stop us from talking about our initial reaction to it all. We honestly felt appalled by the direction the story decided to go in, and what they did to certain characters completely destroys the tension that was worked so hard on earlier in the film, making everything that follows seem out of place and nonsensical. Apparently, it is also a development that was also featured in Gibbons’ book, but it doesn’t seem to have made much sense there either; and though we partially understand the ideas behind it, it’s executed in a way that completely sodomises the character development and everything else that came before it, leaving it as a section of the film that is so uncomfortable and so out-of-turn that it never fully recovers after that. It may sound a bit strange to hear what impact this tiny section of a much larger film can have on everything else we had witnessed, but it really is so ill-judged that it can kill a perfectly fine movie right in its tracks. Sunset Song is, for the most part, a well-made adaptation of the classic Scottish novel with some breath-taking imagery and strong acting… but it’s all derailed by a late section of the film that is so ill-judged and out-of-character it leaves you with a bitterer aftertaste than the film would like to leave you with.